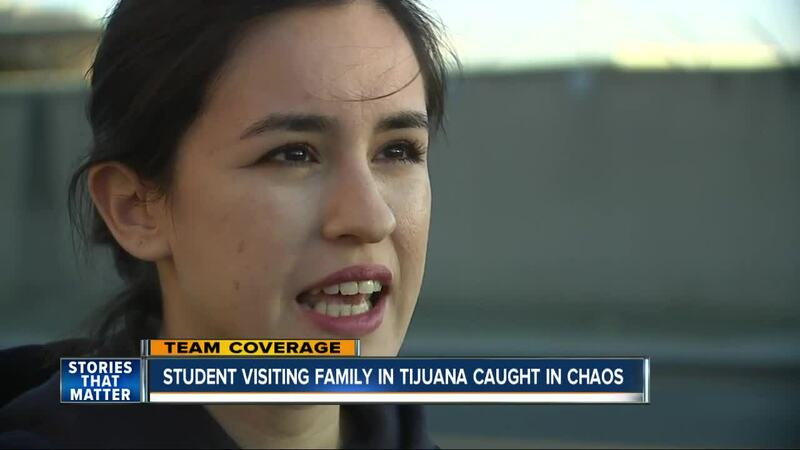 A UC Berkeley student visiting her family in Tijuana had a tough time trying to re-enter the U.S. in the midst of the unrest at the crossing. 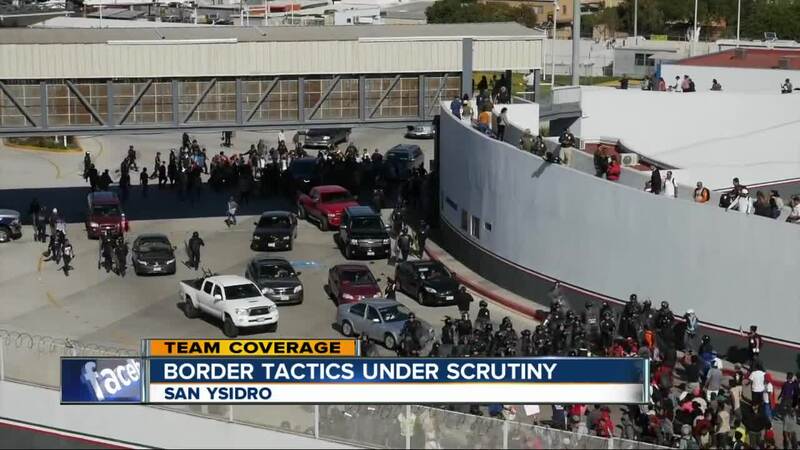 SAN YSIDRO, Calif. (KGTV) - Vehicle lanes and the pedestrian bridge at the San Ysidro Port of Entry were fully operational Monday morning following a day of chaos at the U.S.-Mexico border. The San Ysidro Port of Entry -- the busiest crossing in the western hemisphere, according to the federal government -- was shut down for more than five hours Sunday at the end of the Thanksgiving holiday weekend amid clashes between members of the migrant caravan and U.S. Border Patrol agents. Additional personnel were already deployed to the border Sunday morning in preparation for multiple planned demonstrations on both sides when the decision was made to shut down the crossing. "As the demonstrations on the Mexican side reached the border area, some members of the demonstration split off to head towards multiple locations along the border," Customs and Border Protection officials said. "Some attempted to enter the U.S. both directly east and west of the border crossing. These (are) attempts to illegally enter the U.S., and the response to them continue. Some attempted to illegally enter the U.S. through both the northbound and southbound vehicles lanes at the port of entry itself. Those persons were stopped and turned back to Mexico." As the crowds at the border fence grew, many began throwing debris and rocks at border agents, according to Border Patrol officials. The action prompted agents to deploy tear gas in an effort to disperse the crowds. At least 39 people were taken into custody, according to officials. The unrest also forced the closure several nearby surface streets and the typically busy Las Americas Premium Outlets. Shopping center officials said the Outlets would be open at 10 a.m. Monday. All vehicle lanes and the pedestrian crossing were shut down at around 11:30 a.m.; the pedestrian bridge was reopened at around 3:45 p.m., and vehicle lane were reopened by 5 p.m. Following Sunday's events, the Mexican Interior Ministry announced it would deport about 500 migrants who tried to "violently" and "illegally" cross the border. Caravan members began marching from their shelter at the Benito Juarez sports complex to Mexico's El Chaparral border crossing, Mexican news site Frontera reported around 11:30 a.m. Sunday. Videos posted to Twitter showed caravan members rushing past Mexican federal police who had been blocking them from getting too close to the border. Tijuana Municipal Police detained 39 people Sunday, according to local authorities. Some migrants have been trying to present themselves to United States immigration authorities for asylum, but the U.S. only processes 100 asylum applications a day, leaving thousands on the waiting list. San Diego Mayor Kevin Faulconer posted a tweet Sunday night urging U.S. and Mexican officials to resolve the situation without closing the border. "It is critical that U.S. and Mexican federal leaders work together to safely resolve the migrant crisis," the mayor wrote. "Our way of life relies on a safe, secure and functioning border. From travel to shipping to daily commutes between San Diego and Tijuana, it is essential to our community."